Buy new if possible. Any new bounce house will come with a manufacturers warranty, usually 90 days for the inflatable and one year for the blower motor. Read the product description and specs before you order online. If you are buying used, be cautious. Blow it up before you take it away. Make sure the blower works and then get in there and jump around to make sure it stays inflated and the mesh walls are secure. Inflatables can be repaired but to fix a leak can be very time consuming and a hassle you don’t need. Buying new also ensures that the (ASTM) American Society for Testing and Materials guidelines have been met. Little kids bounce houses can be purchased from between two and five hundred dollars and can generally handle from 100 to 300 pounds total weight which means that you could have up to 3 or 4 little kids playing at the same time. The recommended age for bounce houses is 3 years and up but you can purchase smaller ones for one at a time toddler use. The older the kids the better quality and bigger size bounce castle you will need. If you’re wondering how to buy a bounce house and are overwhelmed by all the choices on the market – here are some points to consider. 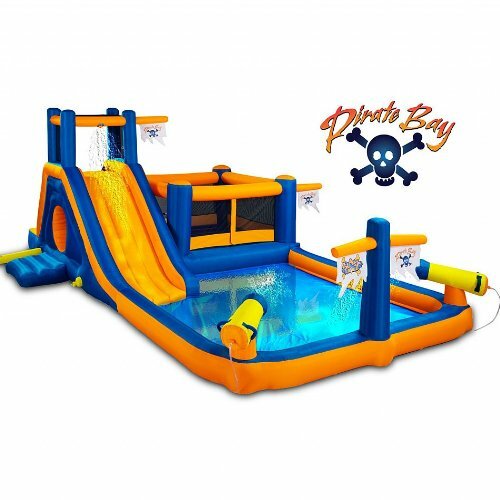 The inflatables are made from either plastics, nylon, vinyl or combinations of these. The best commercial bounce houses are made with 18oz heavy duty, fire and puncture resistant vinyl. Obviously, you get what you pay for and the more you are willing to pay the better you will get. A 15 by 15 commercially used bounce house that you see at special events would accommodate up to 1,000 pounds at one time which is about 12-14 kids ages 9 and under, or 8-10 kids ages 9-12. Most of us don’t need that kind of equipment in our yards but it might give you an indication of the specs that you do need. You will want a bouncy castle that comes fitted with a durable mesh netting on the sides as a barrier to keep the kids from falling out. When you are choosing a bounce house you might want to make sure that it has an inflated platform at the entrance to prevent injury if a child falls out through the doorway. If it doesn’t you should put some sort of protective soft mat outside the door. 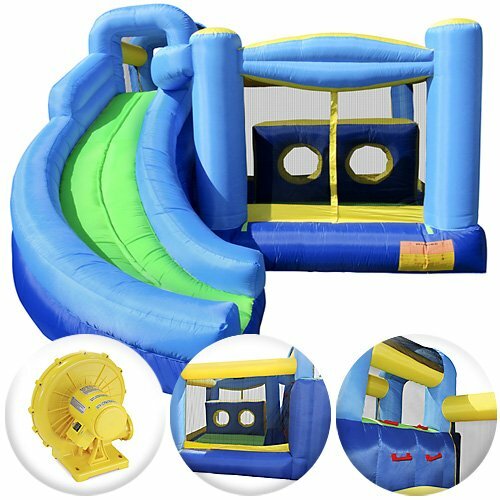 Bounceland, Little Tikes and Blast Zone are three of the most used and trusted brands to look for when shopping for bounce houses. Almost all purchases will include an electric blower for inflation, ground stakes, repair kit and carrying case but make sure to read before you buy. They have amazing themes and styles to choose from. Whatever your kids are into you can find a theme to suit them. Jungle, princess, pop star, sports, wizards, castles, slides, tunnels, ball pits and multi play stations are all available. Just remember, that bouncy castles are great fun and will keep the kids entertained and exercising for hours every day. It doesn’t matter which one you choose, it’s sure to provide plenty of laughs, entertainment and great memories for the whole family.